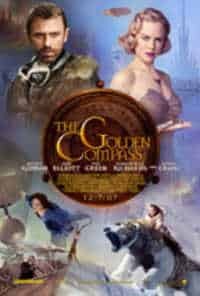 While most children’s movies these days are open-minded enough to try to invite adults in on the fun at least a little, The Golden Compass veers oddly in the opposite direction. In other words, there are controversies and premonitions at work here, some already sensationalized in the media as anti-Christianity themes derived from the original Philip Pullman 1995 British trilogy, His Dark Materials. So that The Golden Compass might best be described as nonconformist kid fantasy film noir. This odds and ends manic mix of snippets dredged from sci-fi parallel universes, supernatural substance abuse, cranky clerics, worrisome wizards, rowdy retro 19th century street urchins, persecuted free thinkers, goth grownup child abusers and computer-generated homicidal polar bear throat slashers, is less likely to dazzle the senses than exhaust minds of all ages. The Golden Compass opens with a far from cheery guided tour of the British parallel universe in question, spoken of in hushed, forboding tones as we’re introduced to the daemons, the souls of humans manifested as brainy wildlife creatures who tag along beside their assigned masters. Not exactly akin to, say, wearing your heart on your sleeve, but more in the nature of an out-of-body experience of a particular inner organ that has a mind of its own and cannot be relied upon to obey in public. Twelve year old Lyra (Dakota Blue Richards), who is quite content with personal daemons of her own (voiced by Freddie Highmore), has other matters on her mind at the moment. She’s an orphan of mysterious origins, in the care of her uncle, Lord Asriel (Daniel Craig). He’s a free thinker scientist being persecuted by the local religious establishment, the Magisterium, for espousing supernatural theories contradicting established church doctrine. When Asriel departs for the Arctic to research a mind-altering magical dust that’s been playing around with people’s heads, Lyra is left in the care of frosty femme fatale with malice on her mind, Mrs. Coulter (Nicole Kidman). When Lyla comes into possession of the Golden Compass, a sort of ancient metaphysical version of cliff notes that possesses the answers to all things, the precocious impulsive orphan takes off in a handy dirigible to the North Pole in search of Dad, with her outer daemons in tow. And while the conniving clergy are wringing their hands back at the cathedral, Lyla meets up with Texas ‘aeronaut’ Lee Scoresby (Sam Elliott), ready to rumble armored and dangerous polar bears (Ian McKellen and Ian McShane), orphans held in captivity by daemon-expunging Gogglers, and a witch at sea who’s dying to know if Lyla’s Compass can tell her which of the men on board was once her lover, we have no idea why. This episode-crammed excursion into far too many other worlds including cyberspace, is adapted and directed by Chris Wietz, whose prior resume that would confirm credibility to take on this task does not exactly boast the prior directing gigs, About A Boy and American Pie. And whether The Golden Compass doesn’t have much of anything to say because there are two more of them on the way to a multiplex near you that will, or else the Compass was low on batteries, is anybody’s guess. Think Nancy Drew and her evil furry twin in a parallel universe, and grownups that are way scarier than any imaginary monsters.